Without a doubt, this chess set is absolutely stunning. The set features grey metallic and gold ribbed Staunton chessmen with a handsome inlaid wood chest and 2 veolur pull string pouches for men. The set measures 12” x 12” with 1.2” squares and a 2.5” king. The great amusement of dragons and their fascinating world comes alive with this magnificent chess set. Get a taste of their wonderful world with this intricately 3D pewter chess set. The set features a themed pewter base with 32 pewter chessmen and a beautiful glass chessboard. The maple and walnut brown tones of the board contrast beautifully with the metal chessmen of this fabulous set. The set measures 12.5" x 12.5" with a 1.5" King. This chessboard is made in Italy by the best artisans. The set features Staunton metal and natural wood men on a walnut/ maple veneer chest style board with removable board and storage compartment underneath. This wonderfully unique set is a masterpiece to be admired! The set measures 13.5" x 13.5" with 1.5" squares and a 3" king. At first sight, it’s clear to see that this splendid chess game set is superb gorgeous show piece! This striking set possess a red decoupage ches board that is coupled with a set of intricately detailed metal and brass Slim style chessmen. The remarkable set features a 3.5" King and makes for a perfect addition to any room. This fabulous chess set features impeccably detailed brass metal chessmen and a stunning black birdseye and maple chessboard. This set measures 17” x 17” with a 3.75” king. Without a doubt, this chess set is one-of-a-kind! This beautiful and eccentric set features a board that measures 17.3" x 17.3". The game board is made from Ivory and Grey with 32 metal chessmen to give it a more commanding appearance. This stunning set features a 3" King and makes a great addition to any room. This set features highly detailed pieces are meticulously crafted by hand from gold and black brass metals. The set features a striking color combination of grey ivory with intricate border inlay. The lavish set features a substantial board measuring 17.25" x 17.25" inches with a King that measures 3.75" inches tall. Without a doubt this chess set is one of a kind! This is an exquisite and unique piece. The set features stunning detailed grey and gold Staunton brass metal chessmen complemented with a black and gold pressed leather chessboard. This set measures 18” x 18” with a 4” king. The craftsmanship used to create this striking chess set is really a master piece that adds a sophisticated flair to any space. The set features a black and white lacquered chessboard with matching Staunton wood and metal chessmen. The set measures 15.75” with a 3.25” king. 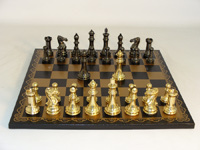 This exquisite chess game is constructed in Italy with the finest briar woods and metals. Its is a impeccable craftmanship is apparent at first sight. The set featues a beautiful hand rubbed lacquer finish over briarwood with Staunton metal chessmen. The measurements for this nice size set: 17.3" x 17.3" with 2" squares and a 4" King. This magnificent chess set originates from Italy and is hand crafted by the famous chess house Italfama. The immaculate design and detail of these chess pieces play beautifully against and the black and gold leafed chess board. The perimeter of the playing surface features accent stitching for a more rich and finished feel. Undernethe the board a red silky soft bed protects your chess pieces when not in use. The set measures 17.5" x 17.5" with a 4" King and 1.75" squares. This Staunton Chess Set is imported for Italy by Italfama. A set that is simple and elegant at the same time. The chessmen are made from solid brass with felted pads for better game play. The set also includes a chess board made from elm root which is a unique and colorful wood with brown and orange tones that creates an irregular pattern. The chessboard features a handsome wide black border inlay that defines the playing field creating a rich contrast against the burl and maple wood. The chessboard measures 16.5¨x 16.5¨with a 2.75¨king. Ready to challenge your opponent to a fascinating game of chess in King Arthur’s court? This handsome chess set is based upon the key characters in the centuries old legends of King Arthur and his kingdom in Camelot. This gorgeous medieval chess set features 32 solid themed pewter chessmen with an elmroot wooden chessboard that is detailed with golden metallic accents. The chessboard measures 22” with 2” squares and a 3.75” king.